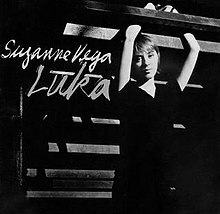 "Luka" is a song written and recorded by Suzanne Vega, released as a single in 1987. It remains her highest-charting hit in the United States, reaching No. 3 on the Billboard Hot 100. Worldwide, the song charted the highest in Poland and Sweden, peaking at No. 1 and No. 2 respectively, and reached the top 10 in Austria, Canada, New Zealand, and South Africa. Shawn Colvin sang background vocals on the record. "Luka" earned Vega nominations at the 1988 Grammy Awards, including Record of the Year, Song of the Year and Best Female Pop Vocal Performance. Vega also recorded a Spanish-language version of the song, included on the single release. A few years ago, I used to see this group of children playing in front of my building, and there was one of them, whose name was Luka, who seemed a little bit distinctive from the other children. I always remembered his name, and I always remembered his face, and I didn't know much about him, but he just seemed set apart from these other children that I would see playing. And his character is what I based the song Luka on. In the song, the boy Luka is an abused child—in real life I don't think he was. I think he was just different. This video was directed by Michael Patterson and Candice Reckinge. It was shot over three days, in New York City. The part of Luka was played by actor Jason Cerbone, who was chosen after the directors auditioned more than 90 children for the part. During a 2012 episode of BBC Radio 4's Mastertapes, Vega revealed that she had written a follow-up to "Luka", from the point of view of the character as he looked back on his life. The song, titled "Song of the Stoic", later appeared on her 2014 album Tales from the Realm of the Queen of Pentacles. The song was covered by the Lemonheads on their 1989 album, Lick. The Lemonheads' singer is also wearing a "Hello My Name is Luka" name tag in the music video for their rendition of "Mrs. Robinson". British indie band Easyworld covered the song on the B-side to their 2004 single "'Til the Day". The song was covered in a bossa nova style by Japanese band the Indigo on their 2004 album My Fair Melodies 2. Laith Al-Deen covered the song on his 2009 album Session. Olivia Ong also covered the song on her eponymous 2010 album. Kasey Chambers covered the song on her 2011 album, Storybook. Slug interpolated the song in the song "Suzanne Vega" by Felt. Hildur Vala Einarsdóttir covered the song on her eponymous 2005 album. ^ "Suzanne Vega - Luka". 45cat.com. Retrieved 18 January 2017. ^ Browne, David (June 18, 1987). "Suzanne Vega: Solitude Standing : Music Reviews". Rolling Stone (502). Archived from the original on 26 June 2007. Retrieved 15 December 2012. ^ "Luka by Suzanne Vega Songfacts". Retrieved 2008-08-22. ^ Kent, David (1993). Australian Chart Book 1970–1992. St Ives, N.S.W. : Australian Chart Book. p. 329. ISBN 0-646-11917-6. N.B. The Kent Report chart was licensed by ARIA between mid 1983 and June 19, 1988. ^ "Austriancharts.at – Suzanne Vega – Luka" (in German). Ö3 Austria Top 40. ^ "Ultratop.be – Suzanne Vega – Luka" (in Dutch). Ultratop 50. ^ "Top RPM Singles: Issue 0869." RPM. Library and Archives Canada. ^ "Lescharts.com – Suzanne Vega – Luka" (in French). Les classement single. ^ "The Irish Charts – Search Results – Luka". Irish Singles Chart. ^ "Hit Parade Italia - Indice per Interprete: V". Hit Parade Italia. Retrieved July 6, 2012. ^ "Dutchcharts.nl – Suzanne Vega – Luka" (in Dutch). Single Top 100. ^ "Charts.nz – Suzanne Vega – Luka". Top 40 Singles. ^ "Notowanie nr287" (in Polish). LP3. September 12, 1987. Retrieved March 9, 2019. ^ "SA Charts 1965 - 1989 Songs J-L". South African Rock Lists. Retrieved June 29, 2018. ^ "Swedishcharts.com – Suzanne Vega – Luka". Singles Top 100. ^ "Mariah, Madonna Make Billboard Chart History". Retrieved 2 June 2016. ^ "Adult Contemporary Music Chart - Billboard". Retrieved 2 June 2016. ^ "Latin Music: Top Latin Songs - Billboard". Retrieved 2 June 2016. ^ "Listy bestsellerów, wyróżnienia :: Związek Producentów Audio-Video". Polish Airplay Top 100. Retrieved August 8, 2016. ^ "Mastertapes - Suzanne Vega (the B-Side)". BBC Radio 4. 12 November 2012. Retrieved 26 July 2017. ^ "Evan Dando & The Lemonheads - Interviews". Retrieved 2 June 2016. Fan letter from Prince to Suzanne Vega in which he refers to Luka as "the most compelling piece of music I've heard in a long time"